Spray 9-inch pie pan with nonstick cooking spray. In medium saucepan, combine honey and margarine; cook and stir over low heat until melted. Remove from heat. Add graham cracker crumbs; stir until evenly mixed. Press crumb mixture in bottom and up sides of sprayed pie pan. Place in freezer while preparing filling. In small saucepan, sprinkle gelatin over 2 tablespoons cold water; let stand 5 minutes. Stir over low heat until dissolved. Remove from heat. 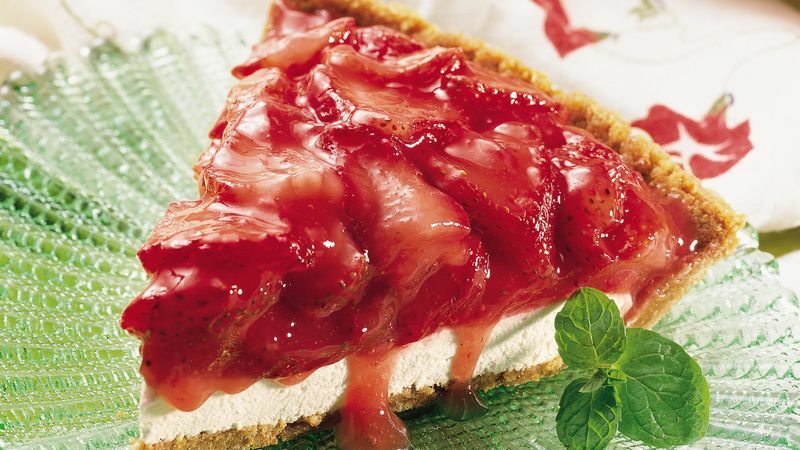 In medium bowl, combine cream cheese and gelatin mixture; beat until smooth. Fold in whipped topping; pour into crust. Cover with plastic wrap; refrigerate. In small bowl, crush 1 cup of the strawberries. In medium saucepan, combine sugar and cornstarch. Add crushed strawberries and 1/3 cup water. Cook until mixture boils and thickens, stirring constantly. Stir in food color. Cool 10 minutes. Add remaining strawberries to cooled mixture; stir gently to combine. Spoon over filling in crust. Refrigerate 1 hour or until set. Serve within 4 hours. If desired, garnish with additional whipped topping. Store in refrigerator.